What is BaZi Four Pillars of Destiny? In recent years, the ancient Chinese metaphysic subjects such as Feng Shui and Four Pillars of Destiny (or in Chinese words 八字 Ba Zi) are capturing worlwide attention. The Chinese in ancient time has learned on how to improve their life and they created a model of human quality of life which depend on three main factors: Heaven Luck, Earth Luck and Man Luck. Bazi or Four Pillars of Destiny is a Chinese conceptual term that describes the four components creating a person's fate or destiny . You can consider this as a map of your life journey. We cannot choose, we cannot run away so whether we like it or not we still have to follow the path in the map. The four components within the moment of birth are year, month, day, and time (hour). The four pillars is a component used alongside fortune telling practices such as Zi wei dou shu within the realm of Chinese Astrology. When a person is born and takes the first breath of air, the influence of this cosmic energy on the newborn is said to map the destiny and characteristics of that particular person. 1. The 8 characters 八字 BaZi or Four Pillars of Destiny. 2. Early childhood luck "tong xian 童限". 3. Decade (10 years "Ta Yun 大运") luck period. The Chinese Four Pillars of Destiny or Ba Zi is a branch of study of Chinese Metaphysics Science. 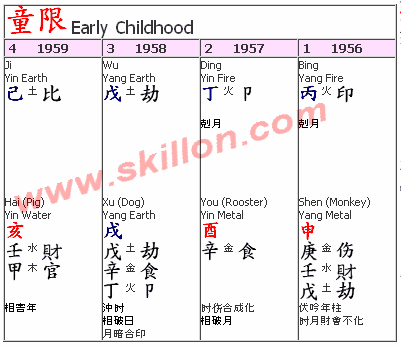 The Four Pillars Chart is derived from the Date of Birth of a Person using the Chinese Solar Calendar, which is also known as the Hsia Calendar or Farmer’s Calendar. This chart can be use to forecast the destiny and characteristics of an individual and the relationships and interaction between the individual with the surrounding environment. This chart is the most important and within this chart the most crucial is the Day Master. The quality of the DayMaster or "Ri Yuan 日元" determine which 10 years, which years, which deities are good or bad. For example for the same person the luck for Strong DayMaster againts a Weak DayMaster are totally the opposite. From the Four Pillars chart by studying the interaction of the characters with each other, one can tell the characteristics of an individual and the relationship between the individual with the surrounding environment. These are the few early years of childhood. 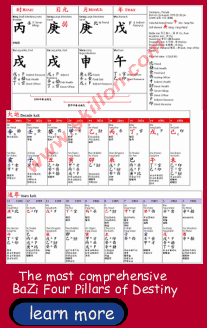 These indicate the luck before going into Decade (10 years "Ta Yun 大运") luck period. It can be used to determine the health of a yound child. Figure 2. Early childhood luck "tong xian 童限"
The luck cycle (10 years "Ta Yun 大运") luck period changes every 10 years. 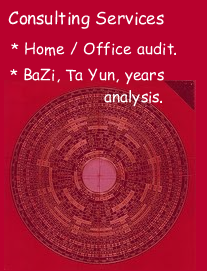 The Bazi luck cycle reading is able see 10 years or more in to the future through the persons Bazi chart interms of Health, Wealth, and Relationship. The advantage in that is, it allows the individual to look out for the good and bad aspect from cycle to cycle. The Four Pillars chart can also forecast the strength and weakness in our destiny which represents the ups and downs of life by comparing the interaction of the Four Pillars chart with the 10-Year Luck Pillars. You might ask me the question. 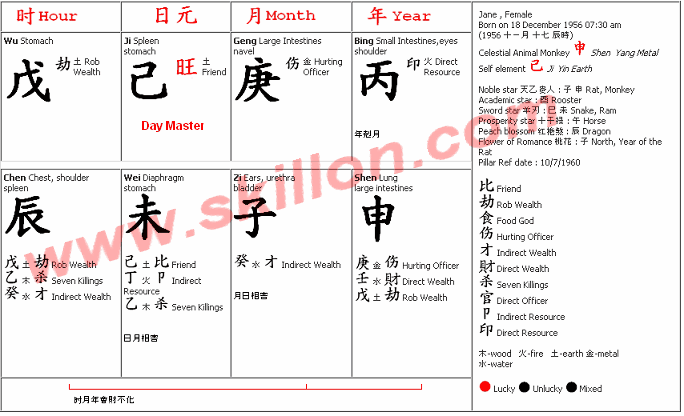 What are all those Chinese characters in the life chart? What does it actually means? There are all your secret codes of your life and changes every day within hours. They are very complicated and very difficult to decode nevertheless on how to read and use them. This is why life so complicated, right? Everyone is born with a set of unique blueprint that we called BaZi or Four Pillars of Destiny. Figure 3. The luck cycle (10 years "Ta Yun 大运") luck period changes every 10 years. 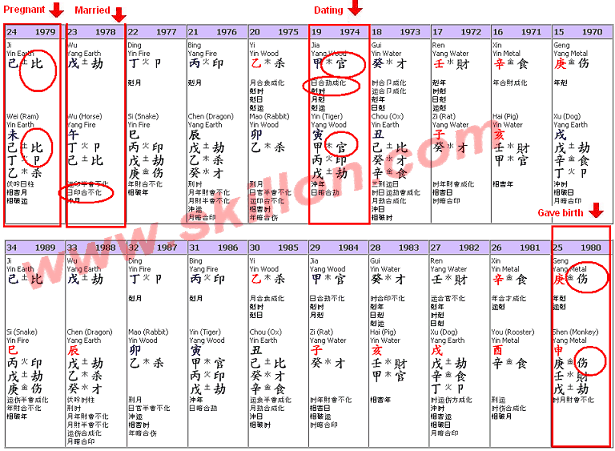 The year luck is determine by looking at the Bazi Chart, the 10 years luck and this particular year. Take the following chart as an example. Figure 4. The years luck. She was born on the 18th. December 1956. 1. Start dating at the age of 19 in the year 1974. The spouse star appeared at both the stem and branch. Her future husband appeared for the first time in her life. 2. They were married in the year 1978. 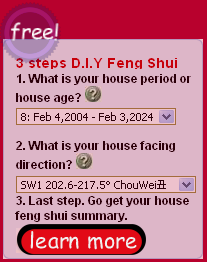 She was then at the age of 23 when stars combined into the spouse palace "夫妻宮". 3. She concieved with her first baby girl in the year 1979. Children stars being enhanced in this particular year. 4. She gave birth to her little girl in the year 1980. Children star appeared at the year pillar. Now, what BaZi can do for me? Bazi is a traditional Chinese Astrology derived from the composition of the Heavenly Stems and Earthly Branches to form the 4 pillars of year, month, day and hour, coupled with the dynamism of the 10 years cycle, called luck cycle, would enable one’s destiny to be understood and to allow informed choices to be made pertaining to one’s undertakings. Take your career as an example. You can be the best that you can be, then why settle for less? Where are you today in your career journey? Where do you want to reach in the next five, ten years from now? Are you doing the right job following the best path? Are you even in the right industry? Have the idea of doing something different or even starting your own business come across your mind? Find out your personality, character, strengths and weaknesses to help you map your path following the least resistance to your success. With this informed choices, one is able to do the right thing at the right time and better of as to better prepared to face any potential challenge during the down time. Better understanding of BaZi enables one to get a head start in one’s life without many hindrances. Bazi also allow us to understand ourselves better. By understanding ourselves, we are also able to understand others beyond the call of a mere Fortune Telling. For example, a smart and beautiful lady, has everything that others are willing to die for but only one thing She is out of reach. LOVE. Why is this so? The answer is her persoanlity or characters. She is very arrognant and like to control everytihng and like to take care of everyone. She is not wrong in the her willingness to care of her man but very few man can tolerate this kind of behaviour. Therefore in order to have love, she must learn how to be more humble and instead taking care of her man just let someone take care of her. In the study of Ba Zi, one has to understand the characteristics and meanings of the ten heavenly stems and twelve earthly branches. Upon understanding these characters, the interaction of these characters between each other can be used to foretell the story. There is a question that being debated over and over again. Whether diffirent people who are born at the same time, data, month, and year, will have the same destiny? I can tell you No. Because there are still other factors that we still don't know affect our destiny. But, the Four Pillars of Destiny make up around 90% of our destiny. Now, another questions probably arise in your mind whether you can avoid or at least minimize your bad luck if you have already know your Four Pillars. The answer is YES. At least we still can minimize the effect of the bad luck, but we cannot avoid it. Like if we know from our Four Pillars that we will have trouble with robbery, we can donate our money to the poor, we still loose our money, but in a minimize way. If we know that we will have body injuries, go and donate blood. Copyrights © 1998-2015 www.Skillon.com. All Rights Reserved.